Users are the actors that do things in an OS. A user is responsible for invoking a program, has a list of unique attributes, and has certain permissions / restrictions. Users can be people or non-people, but as far as the OS is concerned both are almost identical. $ who       # who is logged in? $ w         # who is here and what are they doing? Usernames are what you call yourself as a user. What your User is represented by in the OS. A unique identifier. System users (robots) are UID 0-999, People users are UID 1000+. Groups allow multiple user to share permissions. Every user is usually in their own group and may be added to other groups for additional system access. This is the shell you are given when you login. Usually defaults to /bin/bash on GNU/Linux. Robot users are not given a shell since they don’t login. Most users have a password, but if one is not supposed to they can be given a wildcard password (*), which can never be matched, or an empty password, which is matched on empty input. Below is a line from the file /etc/passwd which stores user information (despite the name, it shouldn’t contain passwords). All of this information is stored in a file called /etc/passwd. As someone interacting with servers, even as a developer, it’s necessary to understand how to manage users and groups on a Linux machine. To add a group, or the permissions of a user/group run groupmod, usermod, and groupmod respectively. Similarly to /etc/passwd, /etc/group carries group information. Acting as root is dangerous! You can accidentally delete your filesystem, forcing you to completely re-install your OS! Type carefully. All users have a specific set of permissions, i.e., things they can and cannot do. The Linux super-user root is not burdened by this and so it can do pretty much whatever it wants. As a person this is important because you can become root and get things done that your user is unable to do. su root Is like logging in as root. Prompts you for the root user’s password. sudo <command> runs a single command as root. Prompts you for your password, but requires you to be on the sudoers list. [dobc@dobc ~]$ yum install httpd      # Runs command as `dobc` user. [dobc@dobc ~]$ sudo yum install httpd # Runs command as `root` user. Create a user on your system for yourself, with your preferred username. 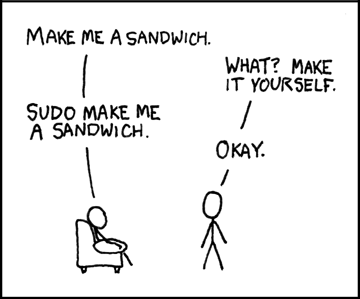 Give your user sudo powers. Use su to get into your user account. Create a directory called bootcamp in your home directory. Create a group called devops. Changing password for user lance.